The Rev. Billy Graham was anxious about his 1954 appearance at the London School of Economics. The school was left-leaning and openly dismissive of religion, and Graham was insecure — he had no advanced theology degree. After he was introduced, something happened that could have derailed the already nervous evangelist. A student leapt into the room through a window and started scratching himself like an ape, clearly mocking the fundamentalist rejection of evolution. The preacher didn’t miss a beat. He laughed and joked, “He reminds me of my ancestors,” then paused and added, “Of course, all my ancestors came from Britain.” The crowd roared, then listened respectfully to his speech. Graham, who died Wednesday at age 99, would be the first to say that his message was not complex or unique. “The Bible says,” was his catch phrase. But he won over audiences worldwide with his friendliness, openness, humility and unyielding religious conviction. By his final crusade in 2005 in New York City, he had preached in person to more than 210 million people worldwide. Graham wasn’t always so skilled. After World War II, as an evangelist in the U.S. and Europe with Youth for Christ, he was dubbed “the Preaching Windmill” for his arm-swinging and rapid-fire speech. His first meeting with a U.S. president, Harry Truman, was a disaster. Wearing a pastel suit and loud tie that Graham would later say made him look like a vaudeville performer, the preacher, unfamiliar with protocol, told reporters what he had discussed with Truman, then posed for photos. But these were early stumbles on his path to renown. A 1949 Los Angeles revival in a tent dubbed the “Canvas Cathedral” turned Graham into evangelism’s rising star. Legendary publisher William Randolph Hearst had ordered his papers to hype Graham, though the evangelist said he never learned why. Expectation-defying crusades soon followed in London and New York that made the preacher a global voice for Christianity. No evangelist is expected to have his level of influence again. Graham became a confidant to U.S. presidents from both major political parties. His first White House visit with Democrat Lyndon Johnson, scheduled to last only minutes, stretched instead to several hours. He stayed at the White House with Republican George H.W. Bush on the eve of the first Persian Gulf War. Graham’s relationships with presidents were a source of pride for conservative Christians who were so often caricatured as backward. They were also a boon for Graham’s ministry. But those ties proved problematic when his close friend Richard Nixon resigned in the Watergate scandal, leaving Graham devastated, embarrassed and baffled. Tapes newly released in 2002 caught the preacher telling Nixon that Jews “don’t know how I really feel about what they’re doing to this country.” Graham apologized, saying he didn’t recall ever having such feelings. He asked the Jewish community to consider his actions above his words on that recording. Graham’s path to becoming “America’s pastor” began taking shape at age 16, when the Presbyterian-reared farm boy committed himself to Christ at a tent revival around Charlotte, North Carolina. After high school, he enrolled at the fundamentalist Bob Jones College, but found the school stifling, and transferred to Florida Bible Institute in Tampa. There, he practiced sermonizing in a swamp, preaching to birds and alligators before tryouts with small churches. He went on to earn a bachelor’s degree from Wheaton College, a prominent Christian liberal arts school in Illinois. There, he met fellow student Ruth Bell, who he would marry in 1943. Graham was ordained as a Southern Baptist and came from a fundamentalist background that expected true Bible-believers to stay clear of Christians with even the most minor differences over Scripture. But as his crusades drew support from a widening array of Christian churches, he came to reject that view. He joined in a then-emerging movement called New Evangelicalism that abandoned the narrowness of fundamentalism to engage broader society. Fundamentalists excoriated the preacher for his new direction, but Graham stood fast. More than anyone else, Graham built evangelicalism into a force that rivaled liberal Protestantism and Roman Catholicism in the United States and beyond. 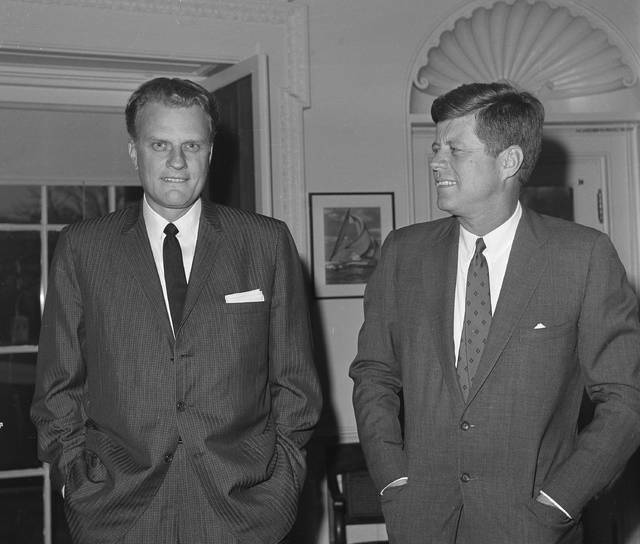 “The ecumenical movement has broadened my viewpoint and I recognize now that God has his people in all churches,” Graham said in the early 1950s. 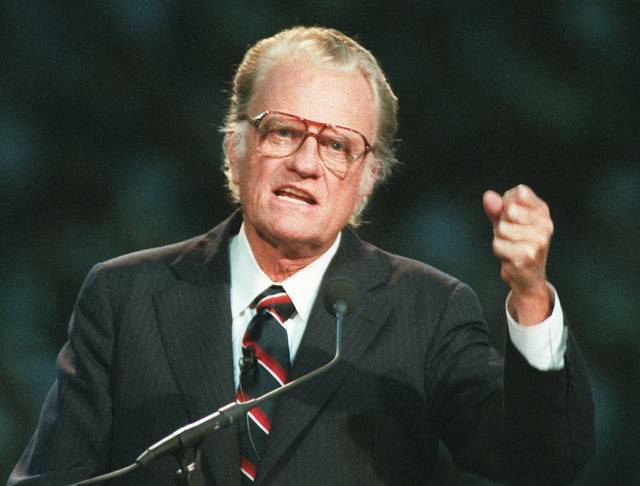 Beyond Graham’s public appearances, he reached untold millions through his pioneering use of prime-time telecasts, network radio including “The Hour of Decision,” daily newspaper columns, evangelistic feature films and satellite TV hookups. The preacher received so many requests for personal advice that in the 1950s he created a syndicated newspaper column, “My Answer,” which at its height reached tens of millions of readers. As Graham’s public influence grew, the preacher’s stands on the social issues of his day were closely watched and dissected. He early on took up the cause of anti-Communism, making preaching against the atheist regime part of his sermons for years. He was much less robust in his support for civil rights, a position he later said he regretted. Graham was no social activist and never joined marches, which led prominent Christians such as theologian Reinhold Niebuhr to publicly condemn Graham as too moderate. Still, Graham ended racially segregated seating at his Southern crusades in 1953, a year before the Supreme Court’s school integration ruling, and long refused to visit South Africa while its white regime insisted on separating the races at meetings. In a 2005 interview with The Associated Press, before his final crusade in New York, Graham said he lamented that he didn’t battle for civil rights more forcefully. Graham’s integrity lifted him through the dark days of the late 1980s, after scandals befell TV preachers Jimmy Swaggart and Jim Bakker. Graham had resolved early on never to be alone with a woman other than his wife. 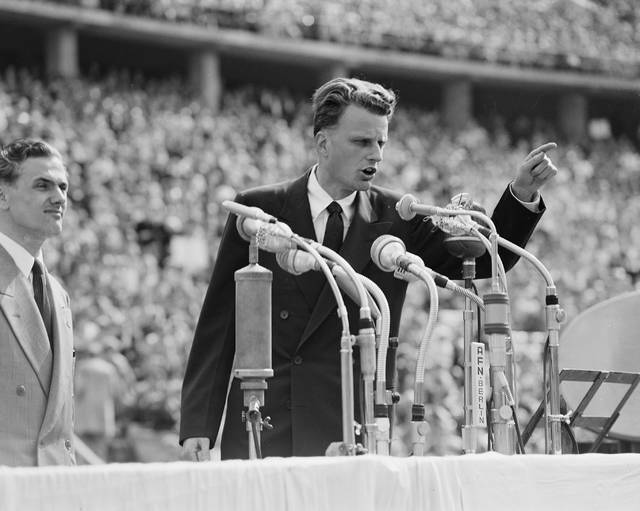 Instead of taking a share of the “love offerings” at his crusades, as was the custom, he earned a modest salary from the Billy Graham Evangelistic Association, which was governed by an independent board, instead of by friends and relatives. The preacher opened a 1983 convention of evangelists from 140 nations by urging the elimination of nuclear and biological weapons. He told audiences in Czechoslovakia that “we must do all we can to preserve life and avoid war,” although he opposed unilateral disarmament. Health problems gradually slowed Graham, but he did not cease preaching, and for years deflected questions about a successor. Finally, in 1995 his Evangelistic Association designated his son, William Franklin Graham III, then 43, as the ministry’s leader — a position the younger Graham still holds. Ruth died in June 2007 at age 87. Graham will be buried by her at the Billy Graham Museum and Library. Retired Associated Press Religion Writer Richard N. Ostling contributed to this report.